“Disgrace” is a truly apt description. This path leads from Scotland’s capital to the Forth Bridge, Fife and the north of Scotland. 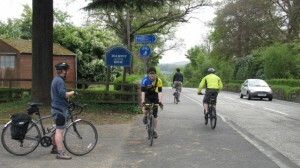 Of all cycle routes in the entire country, it is the one most likely to be encountered by visiting tourists. It is also a vital commuting route to the city from Queensferry and South Fife, and a major leisure route from Edinburgh to Fife, to the round-the-Forth route, and other destinations. The path from Edinburgh to the Forth Bridge should be Scotland’s flagship cycle route, a symbol of Scotland’s intention to become a cycle-friendly nation. Yet in parts it is not only a pathetic example to visitors, but downright dangerous. Other comments received by Spokes from regular path users include… extremely dangerous and unsuitable for bike use … in places approximately one metre wide, surface very bumpy, slippery … hemmed in by stone walls on both sides … Northbound, eye-level is the same level as car headlights so as there is no lighting on the path you simply cannot see what is in front of you. Spokes has campaigned for a decent path here for well over 10 years – indeed, we cannot forget about it, as we continually receive emails and comments from unhappy and concerned users – including feedback about the reactions from European and American tourists. The costs, depending on the path’s quality, lighting, etc could be quite significant in cycle infrastructure terms, with difficult engineering and permissions issues at some points – certainly over £1m. A truly flagship route would cost more. Although high in cycling terms, such costs are literally a fraction of 1% of the annual trunk roads or new Forth Bridge budgets. In addition to tackling the difficult and dangerous sections, the entire route should be assessed – upgraded where necessary, signed, and linked in to adjacent routes and opportunities. Once into the city, soon after Cramond, you are soon onto Edinburgh’s excellent railway path network, bringing you to Roseburn and Haymarket. In the mid 2000’s funding was virtually in place for the project, thanks to a £4.6m multi-year programme to improve links between Edinburgh and surrounding areas, to be funded by Sestran, the Regional Transport Partnership. Then in 2007 the new Scottish government scrapped all capital funding to the RTPs, effectively killing off that hope of early progress. In 2011, some ‘end of year’ unspent government money was found and given to Edinburgh Council to build phase 1, Barnbougle to Easter Dalmeny – a section now widely praised. Given the last-minute nature and the amount of the funding, the council was not able to use the money towards the difficult, dangerous and costly Burnshot section. This project is a one-off for Scotland; it is not your run-of-the-mill project which has to be funded from ordinary government and/or council cycling money, and therefore taking funding from other important local cycle schemes. There are convincing reasons why this flagship Scottish cycleroute should be funded from the government trunk roads budget and/or from the budget for the new Forth Crossing. Way back in 2007, Cabinet Secretary for Finance and Sustainable Growth John Swinney MSP said, in connection with the scrapping of tolls on the Forth Bridge: “We will instead continue to invest in initiatives which reduce congestion, such as improved Park and Ride facilities, and improved rail, bus and cycle links. These are the kind of initiatives which will reduce traffic in and around the bridges” [SG News Release 20.8.07]. This 2007 promise has still not been fulfilled in terms of cycling (with the exception of the Barnbougle-Easter Dalmeny section, above). That the A90 is not a trunk road is a quirk of history, given that it performs a trunk function. Had it been a trunk road, the ridiculous existing path beside it would long ago have been brought up to standard through the longstanding government Trunk Roads Cycling Initiative. And if there should be a trunk cycle route anywhere in Scotland, this surely is it. If the route is funded from existing government and/or council cycle sources that will impact heavily on other cycle projects elsewhere in Scotland, and given the low level of such budgets will mean a wait of probably several more years for the route to be complete. Transport Minister Keith Brown MSP, responding specifically to Sarah Boyack’s and Helen Eadie’s remarks about the route between the Forth Bridge and Edinburgh, said in the above Parliamentary debate, “We have tried to incorporate (cycle facilities) into most of our major projects, including not only the M8 and the M74 but the Forth replacement crossing; indeed, that is how we intend to use the existing Forth road bridge. We have told officials that we should make what we are doing clear to the public.” That surely is an acknowledgement that this route is such a case, and so should be funded from such sources. IF YOU USE THIS ROUTE – PLEASE HELP!! Please contact your own MSPs giving your own opinion of the route and what needs done. Point out that this is a long-overdue project of national significance, which gives a dreadful impression to visitors, quite apart from its hazards for local users, and which should be funded fully and rapidly from either the trunk roads or the Forth Crossing budgets. Ask your MSPs to raise this with the Transport Minister. Find your MSPs at www.writetothem.com. Meanwhile discontent at the absence of a foot/cycle path on the new bridge was also raised in the parliamentary debate. Two articles about this by local Spokes member Bruce Whitehead can be found on our Spokesworkers page in issues 6 January and 25 March.